Create your own chocolate bites and bars with healthy ingredients. 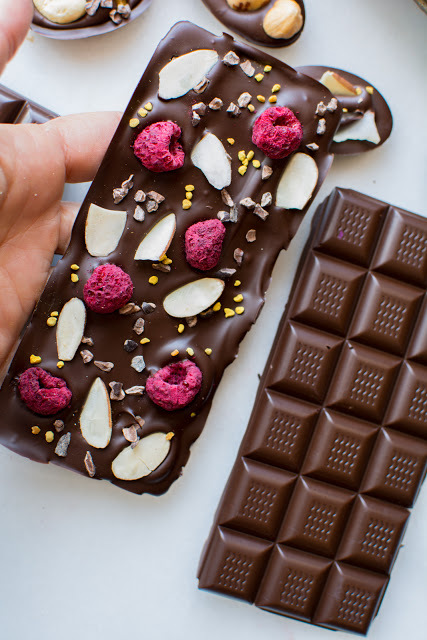 Candy bars can be health food. 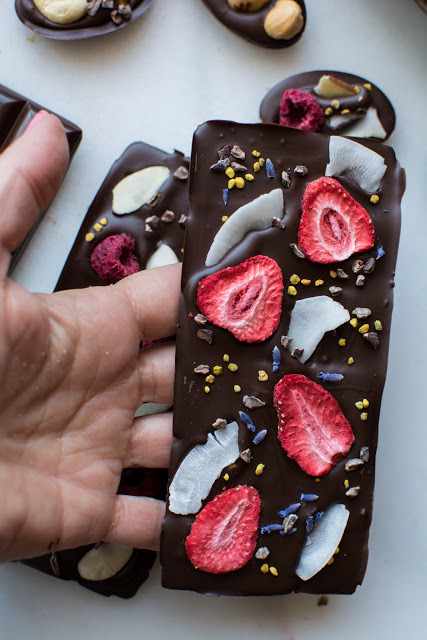 Using a dark couverture chocolate along with organic nuts, freeze-dried berries, coconut, cacao nibs, bee pollen, rose petals, lavender, or a sprinkle of bee pollen. They are so fun to create and are completely addicting. I admit I am completely and wonderfully addicted to chocolate. Deep dark chocolate. I told my husband if he ever wanted to punish me, just take away my dark chocolate. He can have my car, credit cards, and money, but NOT my chocolate! I keep a stash hidden away in a cool dark place. Now I’m stashing my own creations of chocolate bites and bars. Confession time. I ate a bag of Cadbury mini eggs in two days. I couldn’t stop myself. The bite of that wonderful candy shell over the creamy milk chocolate is so addicting. I decided that I needed to have an Easter treat in the house that would be completely satisfying yet on the healthier side without a lot of sugar. I opened my pantry cupboards and starting pulling out bags of nuts, coconut, and roasted cacao nibs. Always cacao nibs. I went into my food storage room and opened large cans of freeze-dried strawberries and raspberries. Finally, I opened my tea cupboard and decided that I would love the addition of rose and lavender with a sprinkle of bee pollen. 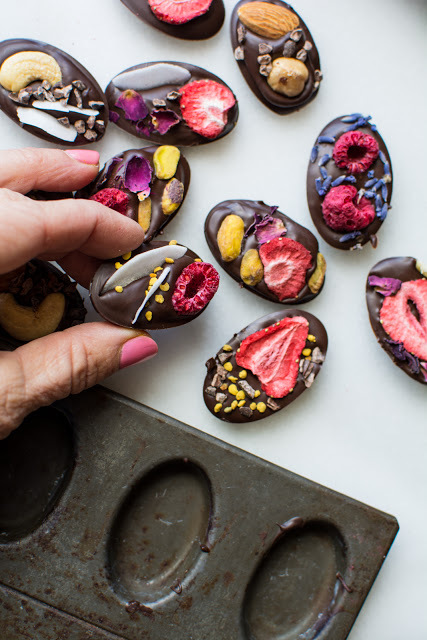 I tempered some of my hidden dark chocolate and created these lovely little bites of heaven. 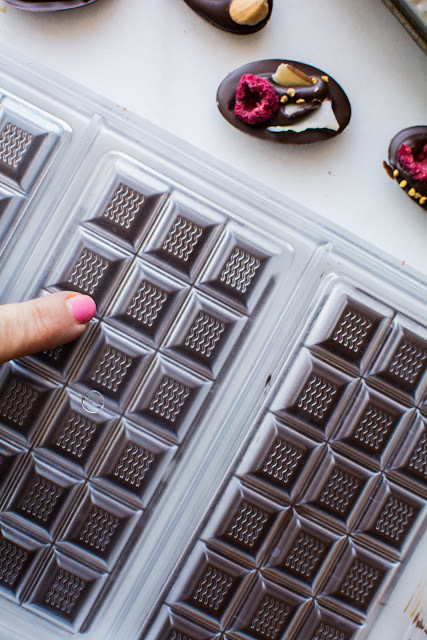 To keep the chocolate bites healthier, use chocolate that is at least 72% or higher. I love 75 – 85% personally. E. Guittard has some great dark chocolates and a few are vegan and delish! A dear friend gave me this vintage candy mold several years ago. I believe it was for molding maple sugar, but works great as a chocolate mold and was the perfect size for the perfect bite. You will need to temper your chocolate. This is the most important and technical challenge in this recipe. 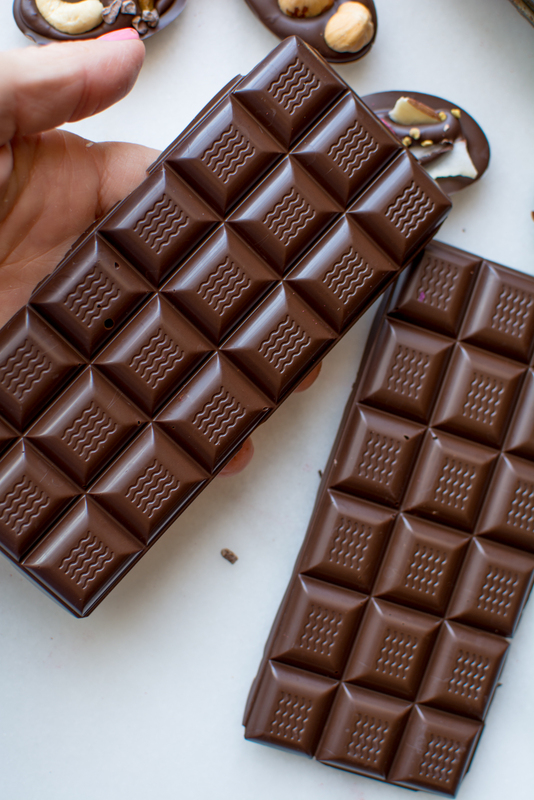 If you do not temper couverture chocolate, the chocolate will crumble, it will have a white bloom streak throughout and it will lose its snap and sheen. 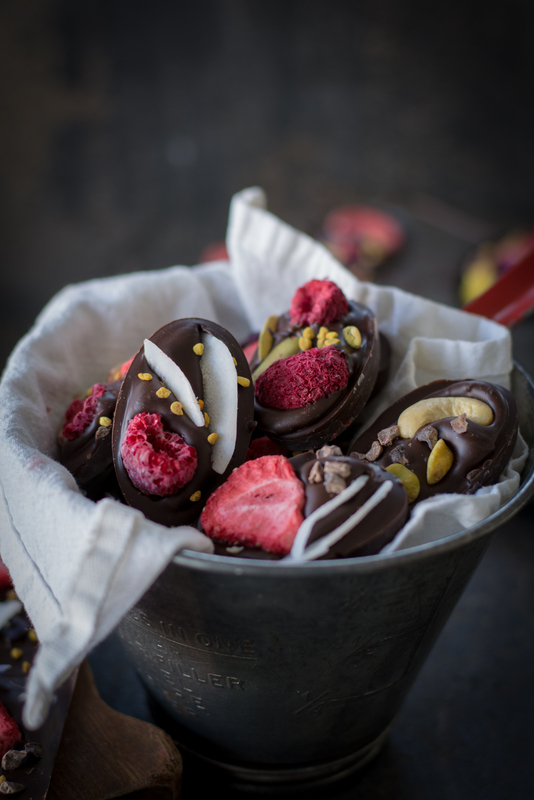 I have been working with chocolate for over 30 years now and it still gets the best of me every now and then. 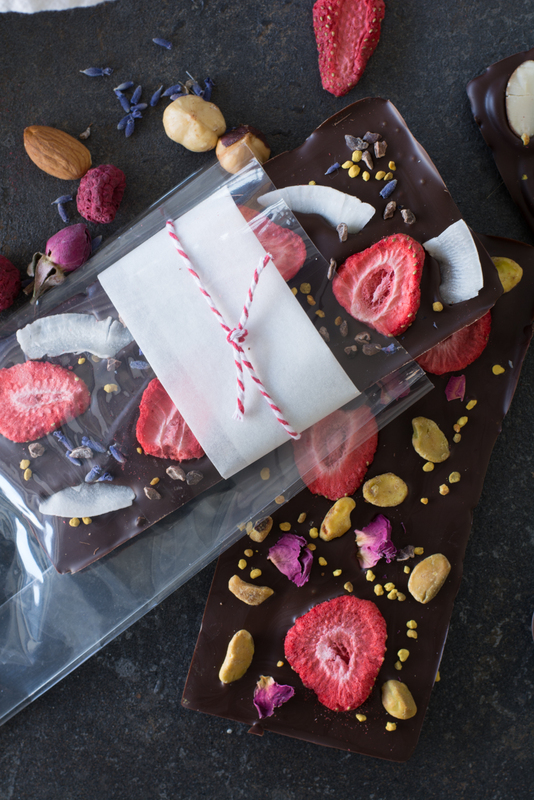 I have found a pretty foolproof way of melting and tempering chocolate at home. 1. Place the chocolate glass or metal bowl in an oven heated to 100 degrees F. Not one degree hotter. Cover with aluminum foil and let the chocolate melt overnight or several hours. 2. 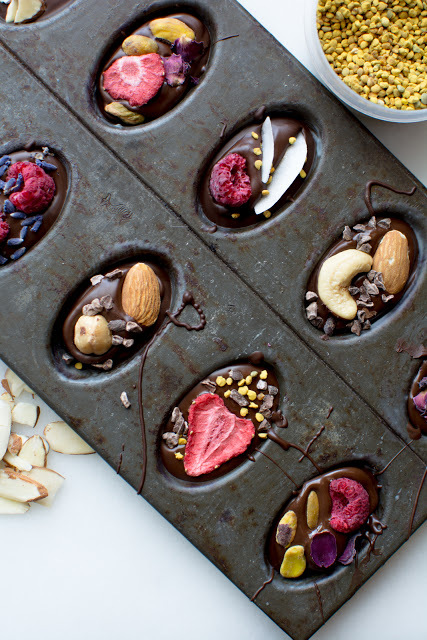 When ready to use the chocolate, place bowl over barely simmering water and bring the temperature to 113 degrees. 3. Remove the bowl from the water and add a small amount of shaved or chopped chocolate to the warm chocolate and stir the chocolate until the temperature has lowered to 84 degrees. 4. Place the bowl back over the hot water and bring the temperature up to 86 degrees and stir for about 5 minutes holding it at that temperature. 5. 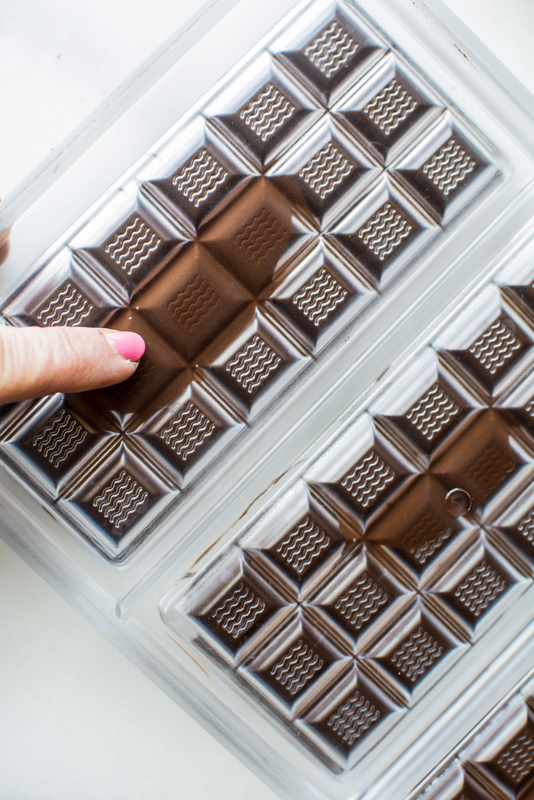 Now you can pour the chocolate into the molds. I know this seems like such a hassle, but worth it in the end. 6. Cooling the chocolate is equally as important. Chocolate cools and hardens best at an ambient room temperature of 68 degrees. Cool weather is better for making candy. Setting up a little station makes the creations easier and more organized. I get asked the question if chocolate chips can be used? My answer is preferably not. Because chocolate chips are made to hold their shape during baking. Melting chocolate chips will leave you with a thick melted blob. 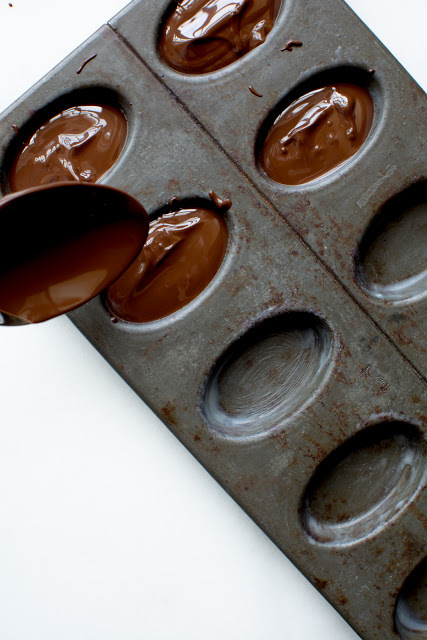 You must add coconut oil, oil or shortening to thin the chocolate chips down enough to dip or mold. The flavor just isn’t worth the effort in my opinion. Don’t let chocolate scare you. 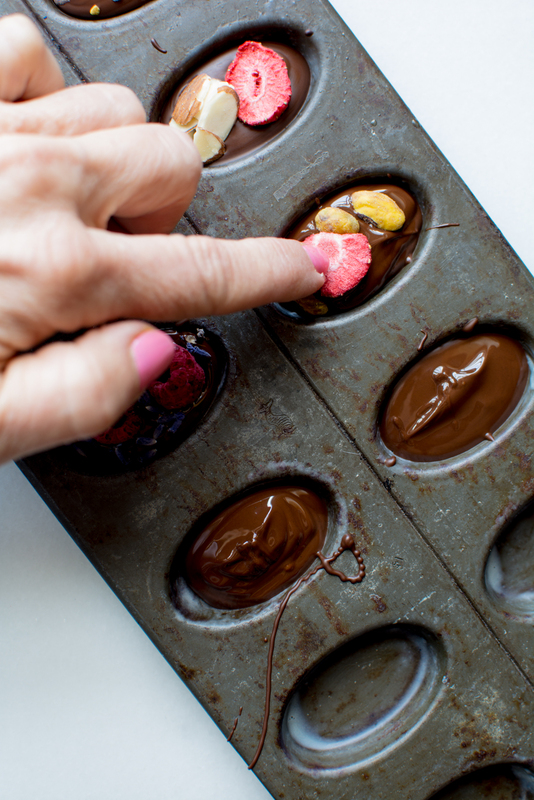 Just be patient and always temper your chocolate before you dip or mold. Even with strawberries or pretzels. 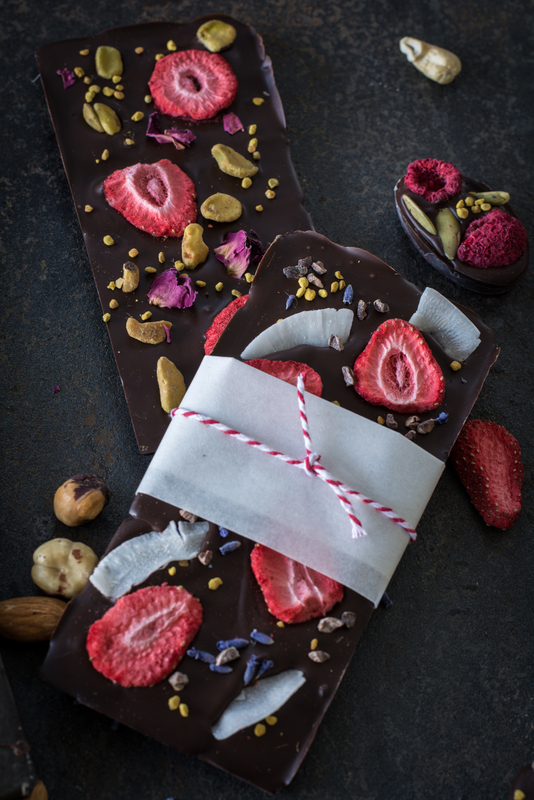 For a beautiful sheen and snap, temper the chocolate. 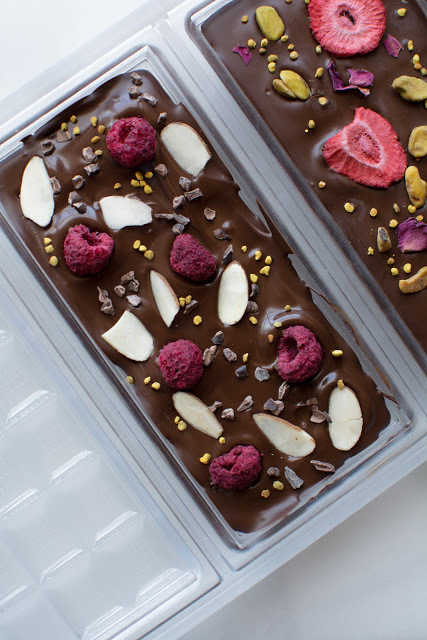 If you just don’t want to mess with tempering, start by using a molding chocolate and then work your way up to a fabulous couverture. Make sure the mold you are using is at the 68 degree room temperature for cooling. If the mold is too cold, it will harden too quickly. This can cause cracking and white bloom. If the temperature is cool outside, I just open a door and try to cool my kitchen to a little less than 68 degrees. I just happened to have a few polycarbonate chocolate molds, so I made some large bars as well. DO NOT…I repeat…DO NOT place the molds in the refrigerator. 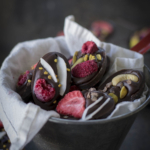 The chocolate will harden too quickly and can cause cracking, white bloom or crumbly chocolate. I have watched a few Youtube videos on making chocolate bars and all the them place the chocolate in the refrigerator for 5 minutes to harden. Don’t do it. Be patient and let the cool room temperature harden the chocolate for you. With the clear mold I can tell when it is time to remove the chocolate bars. As you can see the different color of the chocolate against the mold. The dark brown areas show me that the chocolate isn’t ready to be released. Be patient. Wait for it…wait for it…. Now the chocolate has released itself from the mold. 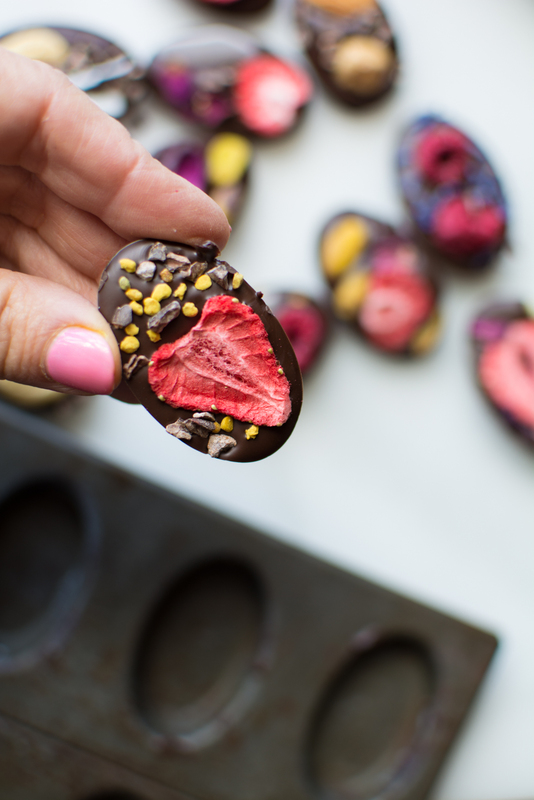 Gently tip the mold over and the chocolate will drop right out. Forcing the chocolate out of the mold my tapping or shaking it out will cause a dull spot on the bar where it had not yet released itself. I have a few air bubbles, which means I should have tapped the mold with the melted chocolate in it on the counter a few times to release the air bubbles. Oh well, at least the chocolate is shiny and tempered very well. It has a good snap to it. 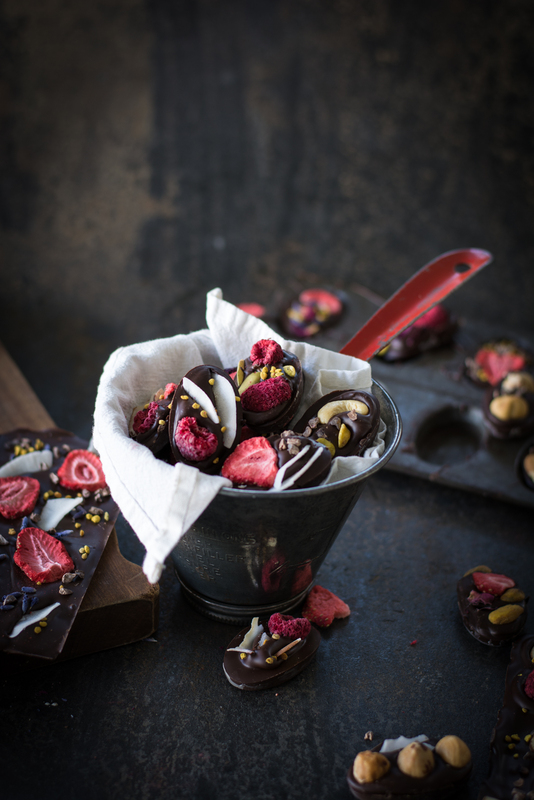 If molds are not available, drop chocolate onto waxed paper by teaspoons and arrange toppings on top the the chocolate mounds. This was so much fun. I loved making the different flavor combinations. My favorite combo was strawberry, rose, pistachio and a hint of bee pollen. Place the bowl back over the hot water and bring the temperature up to 86 degrees and stir for about 5 minutes holding it at that temperature. 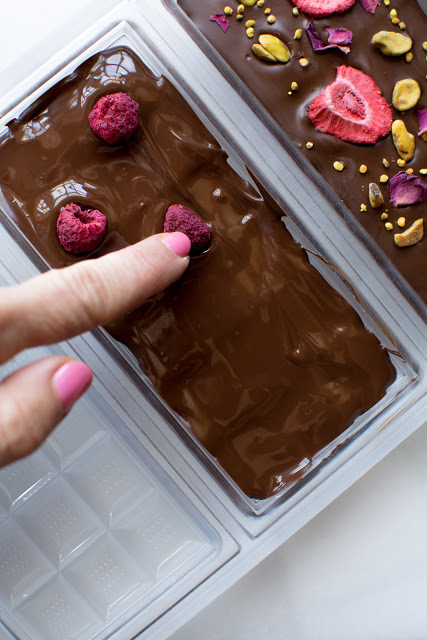 Now you can pour the chocolate into the molds. I know this seems like such a hassle, but worth it in the end. 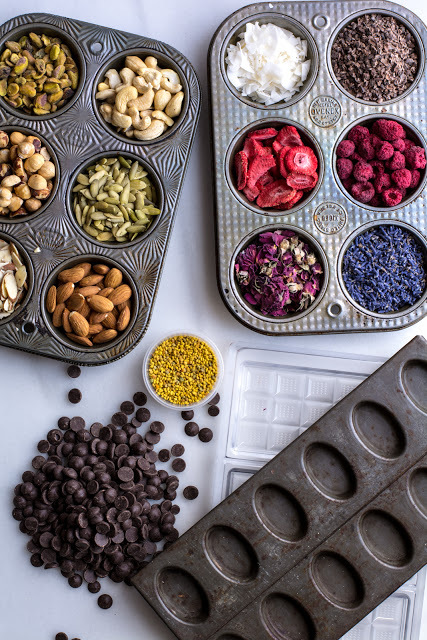 Arrange with your favorite nuts, fruits, seeds, etc. Cooling the chocolate is equally as important. Chocolate cools and hardens best at an ambient room temperature of 68 degrees. Cool weather is better for making candy. Store in a cool place. 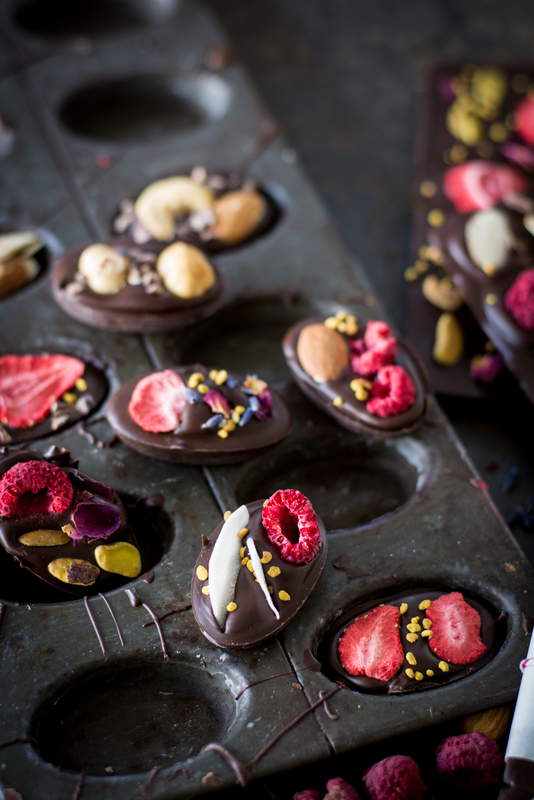 Once the chocolate is tempered, relax and enjoy making your own variations and flavors. I can’t think of any further instructions to give you. If you have questions, just shoot me the question in the “contact me” drop down and I’ll respond as soon as I can. Nutrition calculations are estimated. Depending on the topping and the amount. All nuts would have more calories and fat. Freeze-dried fruit would be considerably less. Fabulous site, Valerie. Thank you so much. Crystallized Ginger? Why didn't I remember that? I love that combo and would have been great with the fruit…next time. I would love to visit this store. Thank heavens for online ordering. I'm sure it would be incredible with the fruit. Next time indeed. I'd love to hear what you think if you do order from Alegio. I think it's high time I visited the store again. I ate my last chocolate from there when I was in labor with my now 1 year old. It's time to go back and get some more. Thank you. 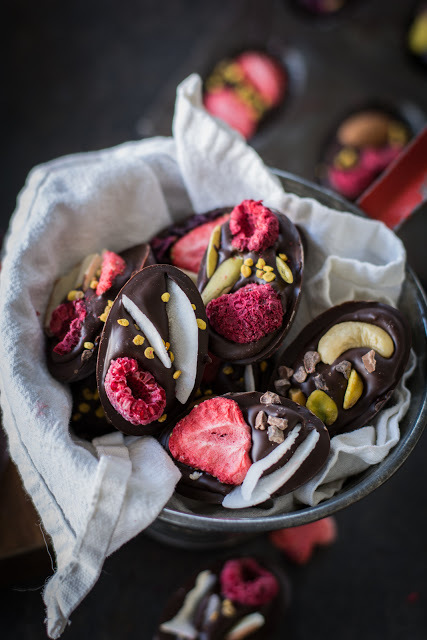 I have been waiting for this post from you for years :)) Love the way you combine chocolate and fruits, so colorful and so cute. 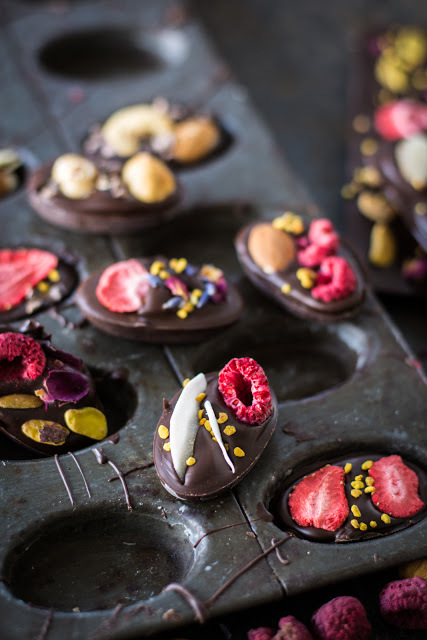 I had a lot of chocolate molds but never have a chance to make one yet, but will soon. Thanks again for your all beautiful and useful posts. You'll have to send me pics of your molds. Thank you for your kind comment.